Salesforce Marketing Cloud is a marketing system that managed to carve a name for itself in the online application market. Boasting of a robust feature set, Salesforce Marketing Cloud comes in as a powerful marketing solution, especially in the social landscape. With this platform, businesses can easily create and maintain a strong presence in the social media while allowing users to keep track of their brand visibility as well as publish and deliver engaging marketing content and advertising campaigns. It has a collection of marketing products to support your marketing needs such as Journey Builder, Email Studio, and Advertising Studio, among others. The platform is designed to help marketers deliver relevant and personalized journeys across devices and channels with the right message at the right time throughout each phase of the customer relationship. This product includes integrated solutions for web personalization, advertising, customer journey management, email, mobile, social, data analysis and content creation and management. With a customer-centric approach, this unified solution empowers you to market smarter with AI, connect each customer interaction, engage customers with personalization effectively. The software helps companies provide a personalized experience to their consumers through a 360-degree view of every customer. By connecting each touchpoint, you can create deeper and more meaningful journeys by delivering the right message at the right time in the right channel. Marketing Cloud products such as Journey Builder is built for creating 1-to-1 consumer journeys for all channels and departments. Salesforce gives users smarter marketing by bringing AI with Salesforce Einstein so you can build predictive journeys and personalized cross-channel experiences. For instance, Einstein Recommendations enable you to drive average order values and convert anonymous web visitors. It also empowers you in recommending the next best content or product to your customers. Meanwhile, Predictive Intelligence uses customer data and behavior analysis to make data-driven predictive decisions. 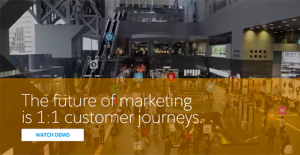 What sets Salesforce Marketing Cloud apart from other tools in its category is how it effectively gives a connected solution across any channel and device for a personalized customer journey. It lets you connect interactions everywhere, combine customer data and behavior, and start relevant conversations in real time. Salesforce Marketing Cloud is packed with products to optimize and automate your marketing processes. You can streamline messaging flows, utilize pre-built templates, and execute cross-channel campaigns with ease. For instance, Pardot, Salesforce’s marketing automation tool, takes manual labor out of your workflows so your team can accelerate the sales cycle. Companies have different wants and requirements and no software platform can be ideal in such a scenario. It is pointless to try to find an ideal off-the-shelf software product that meets all your business wants. The smart thing to do would be to modify the system for your specific requirements, employee skill levels, finances, and other elements. For these reasons, do not hurry and subscribe to well-publicized leading solutions. Though these may be widely used, they may not be the perfect fit for your unique requirements. Do your homework, look into each short-listed application in detail, read a few Salesforce Marketing Cloud reviews, speak to the seller for explanations, and finally choose the app that presents what you want. How Much Does Salesforce Marketing Cloud Cost? The Salesforce Marketing Cloud pricing is based on each customer’s individual needs. The package is tailored to your company’s size, industry, requirements, and price considerations. To get pricing information, contact the vendor to request a quote. We realize that when you make a decision to buy Marketing Software it’s important not only to see how experts evaluate it in their reviews, but also to find out if the real people and companies that buy it are actually satisfied with the product. That’s why we’ve created our behavior-based Customer Satisfaction Algorithm™ that gathers customer reviews, comments and Salesforce Marketing Cloud reviews across a wide range of social media sites. The data is then presented in an easy to digest form showing how many people had positive and negative experience with Salesforce Marketing Cloud. With that information at hand you should be equipped to make an informed buying decision that you won’t regret. A good solution with some drawbacks! Shifting to SalesForce Marketing Cloud has given a whole new height to our email systems. What are Salesforce Marketing Cloud pricing details? What integrations are available for Salesforce Marketing Cloud? Pros: I love the fact that now all of our emails are under one place. Earlier, I couldn’t keep any insights of all the triggered or event driven emails but now I can make the changes and can see now what amount of emails we have sent and how they are doing. We also get the ease and flexibility to perform things. We deal with a number of programs, segments and customization in our email systems and our aim is to provide an unbiased email experience to our users. I was able to gain the knowledge about these on my own but most people tend to take the help of the service team with extra cost. Cons: For new users, technology can prove out to be a little hard and for me, the first experience was a similar one as I didn’t know what to do first. But as soon as I started, the slow learning process started. We built a huge program which includes triggered or event driven emails, programs for our Business to Customer emails, FTP data uploads. We manage to use the Salesforce integration for the B2B business activities. A frustrating fact for some of the feautures is that you had to pay extra for something which can’t be utilized by you. Pros: It is quite easy to use the navigation to find the things. The organization of everything is very nice. Also, there are a number of reports and features available, although I didn’t get time to check each one of them. It’s easy to you after you get used to the peculiarities and if you have some knowledge about HTML. Cons: Currently, I am not using the new version for my business. It might be a challenge for the solutions of the HTML accessibility, but still, it’s not easy to use the email wizard. I am not being able to sort the content again and this is a great problem, though I have been said that it will be addressed soon. For me, the highlights were the seamless ability to segment my subscribers and do A/B testing which are important tasks for email marketers. Best marketing cloud for email. A successful and comprehensive platform to approach customers and a good sale follow through! Measurable and extremely useful for small teams! If you need more information about Salesforce Marketing Cloud or you simply have a question let us know what you need and we’ll forward your request directly to the vendor.